It would be easy to look back at this song and write it off as a racist piece, taking the mickey out of the mish-mash language that was used, and is still used as far as I know, to help communication between the whites and black, most prominently in the mining industry where migrant workers from other African countries were prevalent making the exclusive use of one of the local languages such Zulu of Xhosa difficult. 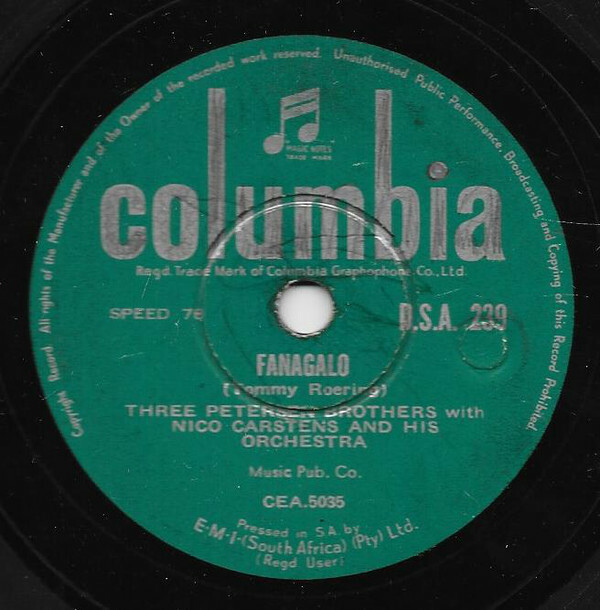 The Petersen Brothers (Mervyn, Basil and Andy) took this language as the subject for their song way back in 1955 when Fanagalo was in its infancy and was probably something novel at the time. It was also the norm back then for black ‘boys’ (the derogatory term used for any black male) to be servants working in the gardens of white people. Interestingly this song also has Jim, the servant in the song, not only working in the garden but also doing the cooking in the kitchen. It is further interesting to note that Fanagalo was one of the few linga franca’s in the world that took on more of the local language rather than pervert the English of the settlers from Europe. There is an innocence to this bright and breezy pop tune, which is driven along by the boere musiek sound of the Nico Carstens Orchestra, that belies the offensiveness that it would carry today, to the extent that one is hard pressed to believe that the Petersen Brothers were being deliberately racist. Rather they seem to be seeing something humourous in a time of weirdness and in things that we today would see as politically incorrect, but back then would have been perfectly normal. This track is included on this list as one that is part of South Africa’s chequered past. It has historical significance in reflecting the attitudes of the day, attitudes that are no longer regarded as acceptable.